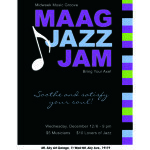 Our MAAG Holiday Market Is Coming…You Won’t Want To Miss It! It’s our annual Holiday Market at the Mt. Airy Art Garage! Our artists will be filling the house with their original, unique work. You will find one-of-a-kind items, for adults and children alike, made by woodworkers, glass artists, sculptors, painters, graphic artists, jewelers, photographers, ceramic artists, and more. Our resident artist studios will be open as well featuring master quilters, dumpster diva sculptors, letterpress printers, and master leathercrafters. The Mt. 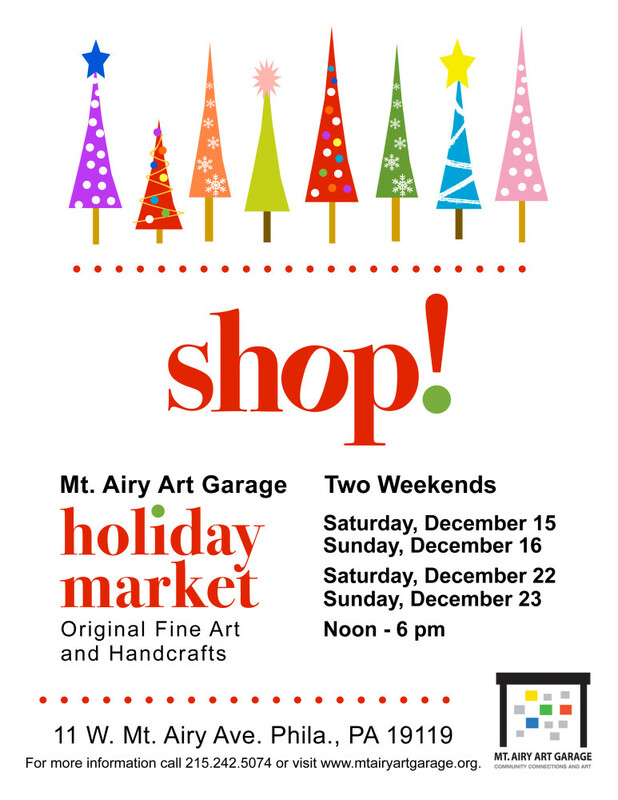 Airy Art Garage gift area will include fine art and handcrafts by well-known local member artists including Sara Steele, Amir Lyles, Kathy Robinson, Andrea Abrams Herbert, and others. We’ve got lots to celebrate so join us. We will be open TWO weekends, Saturday-Sunday, Dec. 15-16 and Dec. 22-23 from noon till 6 and will feature all original fine art and handcrafts by local Northwest artists. 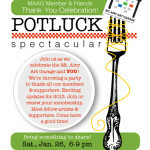 So support your local artists and celebrate with us at MAAG! 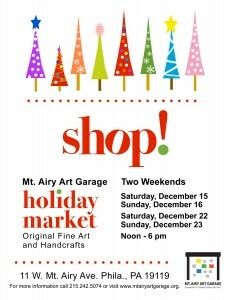 http://mtairyartgarage.org/wp-content/uploads/2012/12/HOLIDAY-MARKET-FLYER-2012-e1392989214514.jpg 1000 773 Arleen http://mtairyartgarage.org/wp-content/uploads/2016/06/maag-in-action_main-1024x274.png Arleen2012-12-09 20:27:322019-01-30 15:01:40Our MAAG Holiday Market Is Coming...You Won't Want To Miss It!